A Revolution in Triking. The Rover has introduced more people to trike riding than any other recumbent trike on the market! The Rover has introduced more people to trike riding than any other recumbent trike on the market! 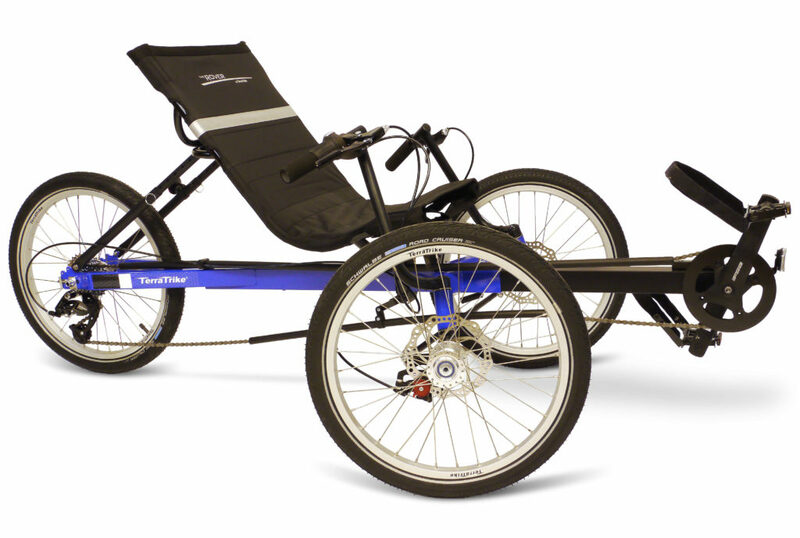 TerraTrike’s most popular model, the Rover, has built its following by providing excellent reliability and usability, as well as a starting price lower than almost any other trike on the market. The strong frame and high seat position make the Rover perfect for anyone who wants a solid, well built, no-nonsense machine. If you are ready to experience the joy of riding a TerraTrike, the Rover is the perfect entry level choice. The Rover has gone through some noteworthy evolutionary changes! The redesigned ‘Y’ frame gives the rider easier access when getting onto the trike, while the robust Hi-ten steel frame provides a weight capacity of 400 pounds; more than most trikes on the market. The internal hub is maintenance free and allows the rider to shift easily, even when stopped. The external hub uses a more traditional derailleur system. The drivetrain of the Rover needs no idlers, meaning less noise and more efficiency. The Rover frame is designed to be disassembled for transportation and for converting into a Tandem with the Rover Tandem Attachment. Cobalt Blue paint and graphics come standard on all of the Rover models. If you purchase a Rover 8, I highly recommend adding the Patterson Metropolis front drive. This turns the trike into a 16 speed and greatly enhances the riding experience. This is a very sturdy trike. It is not the most stable at higher speeds (15 MPH +), but it is great for exercise and leisure riding. I enjoy the comfort it offers while riding. No sore rear end when riding this! I am very pleased with this purchase and would recommend it to everyone.